Britpop vets Suede have been reunited for a few years now, releasing the comeback album Bloodsports in 2013. Next, they are taking some time to revisit their legacy by preparing a box set of all their singles. It's due out on April 14. 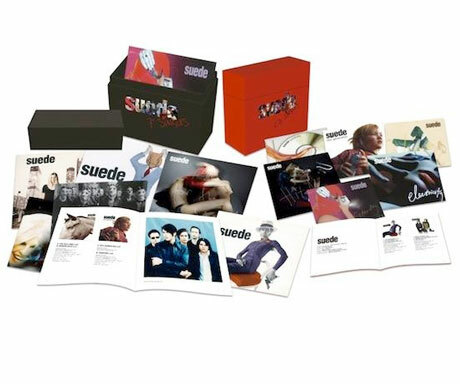 There will be a total of 2,000 box sets made, half of them CD and the other half 7-inch vinyl. These will include all 24 singles the band released between 1992 and 2013. The CD set will be beefed up with extras, since it includes nearly ever B-side from all of the various formats over the years. An announcement from the band notes that this includes difficult-to-find cuts that were left off the band's last batch of reissues. What's more, this is the first time that the singles and B-sides from Bloodsports been released as CD singles. It costs £79.99 ($148). As for the 7-inch box, it comes with reproductions of the band's 11 prior 7-inches, plus 13 new 7-inches that have never been on the format. The B-sides were selected by frontman Brett Anderson. It costs £99.99 ($185). Both formats come with a digital download coupon. An informative trailer video for the box sets are below. The first 250 orders will receive a limited-edition print of a lyric poster for "Trash," signed by Anderson. Check out the purchasing options here, though these may be tricky to get in North America. This follows a prior box set of all of their bands LPs on vinyl.